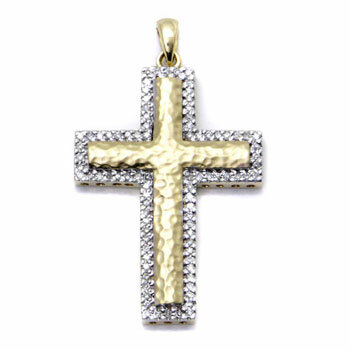 From a classic design of a cross, this shiny gold cross pendant is created. The border of this pendant is decorated with glittering diamonds which is so extravagant. Moreover, the yellow gold pendant inside the border has a hammer finishing. Therefore, it has a very unique texture that looks so interesting. To compliment the pendant, you will also get a yellow gold rolo necklace, so you could proudly wear it everywhere.